Come enjoy fly fishing for Smallmouth Bass and Northern Pike on our Main Lakes, Remote Lakes and Rivers! "...AND BY THE WAY THE FISHING WAS OUTSTANDING...I HIGHLY RECOMMEND Waterfalls Lodge!" A trip to Waterfalls Lodge offers fishermen exceptional fishing at a first rate resort. The following review was received from Bill Spicer of the New Fly Fisher Show. I would whole heartily recommend Rob and Kathy at Waterfalls lodge. This is a first rate resort that is geared for your comfort. They have a fleet of new 16 foot boats with 20 horsepower motors and sonar and electric trolling motors. The food is outstanding; the rooms are extremely comfortable and better yet, extremely clean. There are private lakes they travel to that are chock full of fish. The smallmouth fishing is outstanding; I took big fish on streamers and poppers. The biggest smallmouth I got was about 5 pounds but I did see much larger fish. 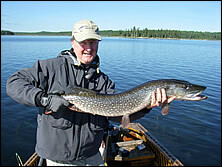 The walleye fishing is second to none along with excellent pike fishing. They do have lake trout, whitefish and crappie in the area, but I did not try for those. The lodge has full American plans along with evening meal plans and housekeeping plans. Guide service is also available, or you can go on your own as they will give you maps of the lakes with the best fishing clearly marked on them. 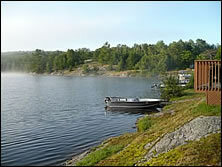 There are cottages right on the waterfront with docks for each cottage. They have large motel style rooms that are extremely comfortable. The dining room is equipped with a bar and pool table along with television. I cannot say enough about this place. The owners go the extra mile to make sure you are comfortable. Please give them a call and find out the best time for you to be there, and please mention that you talked with me. For the full story of Bill Spicer's trip to Waterfalls Lodge take a look at Bill's blog postand the additional pictures below. We have custom-built, brand new boats! They have everything needed for the serious fisherman. For anglers who love to fly fish there are great opportunities to catch both smallmouth bass and northern pike on the fly. The preferred rods are medium fast to fast-action 6-8 weight rods in the 9-9 ½ foot range that will all work well for pike and bass. For reels a simple click/pawl reel is all that you require. A Weight-Forward (WF) line matched to a 6-8 weight rod will handle most conditions. We recommend you bring a full sinking line like a Type 3 (3-4 IPS) or greater to get flies down deeper when the fish go deeper. Most bass and pike can be caught in the 3-10 foot range. Leaders in the 8-10 foot length are ideal with 8-10lb rating (0x-3x). Surface – We recommend foam, plastic and deerhair poppers in black, green and yellow. Yellow seems to be the hot colour most of the time. Ensure your poppers can make lots of noise, that really rings the dinner bell for bass. Subsurface – Streamer patterns in sizes 2-10 work very well on the bass. Black, olive, white and yellow are extremely effective choices. Top patterns include: wooly buggers, muddler minnows, zonkers, strip leeches and any sculpin patterns such as zoo cougars. A Northern Ontario pattern that is very popular is “Scottys McFly” in white which is deadly. Surface – Any big poppers that make lots of noise and create a wake work well around weed beds, beaver lodges and near drop-offs. Fish big foam poppers (sizes 1/0 to 3/0) with a slow retrieve. Strikes by pike will be vicious. Subsurface – Big flies that imitate either yellow perch or walleye are a good bet on our waters. Use big streamers (1/0-3/0) in green, yellow, red/white, black and white. Use a full sinking line or intermediate line using a slow twitch retrieve. Ensure you use wire leaders such as RIOs Bite Tippet or Tyger Leader.